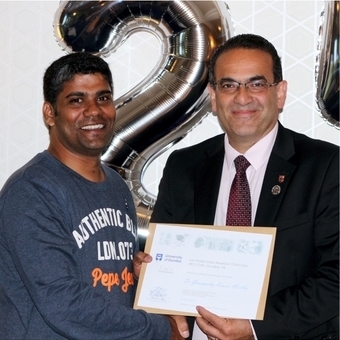 Dr Ganapathy Koneri Murthy was presented with the Department of Orthopaedic & Trauma Surgery’s 25th Ian Smillie Class Award of Distinction from Professor Rami Abboud at the TORT Centre at a special celebratory dinner on 2 June 2018. This prestigious prize is awarded annually to the Master of Orthopaedic & Trauma Surgery (MCh Orth) degree student who has attained the highest overall mark for the year. Not only did Dr Murthy win the Ian Smillie Award, he also won the Scientific Communication Award, so congratulations on being an MCh (Orth) double winner! Dr Murthy’s research project, “Does continuous walking provide more realistic gait analysis than short interval trials?” was supervised by Professor Rami Abboud and Dr Graham Arnold. This class award of distinction is named after the late Professor Ian Smillie who was the founder of the Department of Orthopaedic & Trauma Surgery at the University of Dundee in 1968. He gained a worldwide reputation in knee surgery and the role of the meniscus. In 2007 Professor Smillie was posthumously awarded the American Orthopaedic Society for Sports Medicine’s (AOSSM) highest honour - entry to the ‘AOSSM Hall of Fame’ for his significant contributions to the specialty of Sports Medicine. Left: Dr Murthy and Professor Abboud share a joke at the award presentation; Right: Ganapathy at a dry bone upper limb workshop. Other recipients of the Ian Smillie award include two of our consultant orthopaedic surgeons at Ninewells Hospital & Medical School, Mr Manhal Nassif (Class of 1996) and Mr Arpit Jariwala (Class of 2003). “Dr Ganapathy Koneri Murthy is now the 25th recipient of this prestigious class award of distinction. He is now joining a small but exclusive group of 24 previous winners from amongst our graduates. I am glad he dressed for the occasion! All kidding aside, Ganapathy has shown great understanding of how much work and dedication it takes to win the best overall student of the year. He is an intelligent, hard-working and likeable individual and we all wish him, as we do every, student, every success in his onward medical career”.